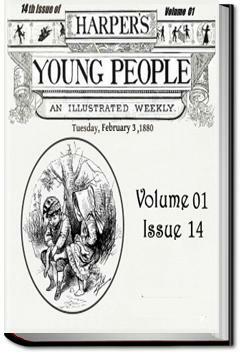 Harper's Young People was an illustrated weekly publication for children containing serialized stories, short stories, fiction and nonfiction, poetry, craft projects and more. This 14th issue of the serial, published on February 3, 1880, features an eclectic collection of stories sure to delight present-day children as it did the children of centuries past. This serial was published by Harper & Brothers, known today for their other publications Harper's Bazaar and Harper's Magazine. . . .eatest length of which is about six feet, forming a saw, armed at each edge with about twenty large bony spines or teeth. Mr. Yarrel mentions a combat that occurred on the west coast of Scotland between a whale and some saw-fishes, aided by a force of "thrashers" (fox-sharks). The sea was dyed in blood from the stabs inflicted by the saw-fishes under the water, while the thrashers, watching their opportunity, struck at the unwieldy monster as often as it rose to breathe. THE STORY OF OBED, ORAH, AND THE SMOKING-CAP. BY MRS. A. M. DIAZ.